More than just an exam room, an exam lane is the comprehensive site where patients have their vision checked and ophthalmic professionals spend eight to ten hours of their day conducting exams and meeting with patients. So, what makes an exam lane? Well, exam lanes include a number of equipment and instruments to diagnose various conditions, prescribe corrective lenses for patients, and give detailed, descriptive reports that improve the ease of diagnosis while reducing the margin of error. These pieces range from the seat where patients sit for the exam to the slit lamp, visual acuity system, and more equipment designed to measure and test parts of the eye. As we all know, technological advances in the ophthalmic industry have boomed in recent history. In the past, exam rooms were the sites of manual and analog vision testing, which took time and cost the practice time and money. New exam lane components are automated, digital, and computer-based. Sold as packages, or as individual components, an exam lane may be a pricey investment for some new ophthalmic professionals, opticians and optical retail business owners; however, businesses consistently find that they quickly recover (and exceed) the cost of their investment through the streamlined, efficient workflow that an exam lane affords. Your exam lane is the foundation of your practice; this is where you meet with patients, perform tests and exams and give results. Since most exam rooms are small, it’s difficult to find an exam lane that allows you provide customers with a comfortable area for their exam while still making the most of the available space. Beyond space constraints, there are many components to putting together a comprehensive exam lane that has the equipment you need while still staying within your budget. While not every tool listed is required, these are typically the pieces to start with when opening a practice. Some of these instruments individually can cost thousands, and you could find yourself taking hours to pinpoint the perfect pieces for your manual exam lane. That’s why Veatch has taken the time to do the research for you and put together several exam lane packages to relieve your stress and costs. After over 27 years, Veatch has become known and trusted throughout the industry, creating new, more efficient technology as a result of the years spent serving ophthalmic practices. In fact, by mixing and matching the best of the best to create our custom exam lanes, we can save you up to 40% over the cost of the core brands, like Haag-Streit and Reliance. At Veatch, we offer several impressive exam lane packages that utilize the most efficient equipment and saves you up to 40% compared to other brands, such as Haag-Streit and Reliance. Exam chair and stand: This chair and stand combo is optimized to meet both space and functionality needs of ophthalmic professionals. It includes a pneumatic assist reclining back, functionality for instrument delivery and instrument arms. Additionally, it has pivoting and tilt features, as well as an overhead halogen lamp. Manual Refractor: The Veatch Manual Refractor has coated lenses and synchronized cross cylinder, as well as aux. lenses. Refracting range of -19D to +16.75D, with an additional 8D using the auxiliary lenses. Visual Acuity System: The package includes a digital acuity system, which comes complete with everything needed to mount to your wall and configure for your rooms dimensions. 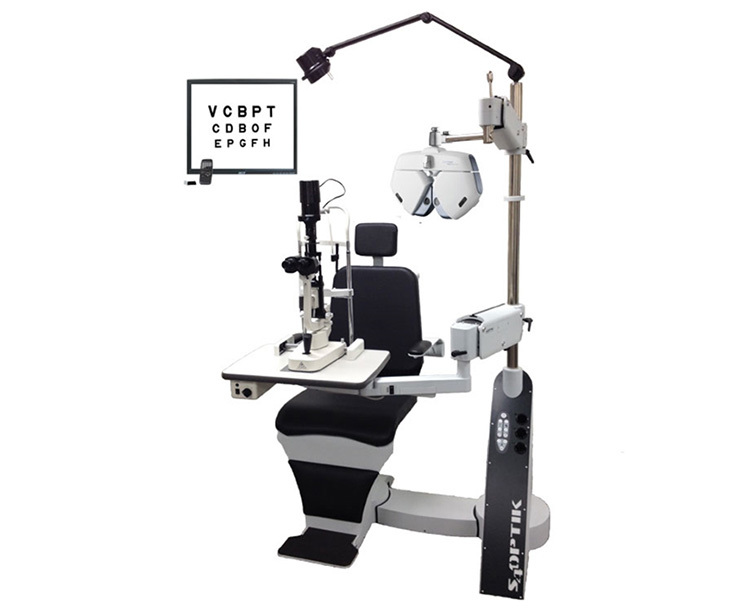 Slit lamp: You have your choice of the Veatch Ophthalmic E-200 or Z-500 slit lamp. 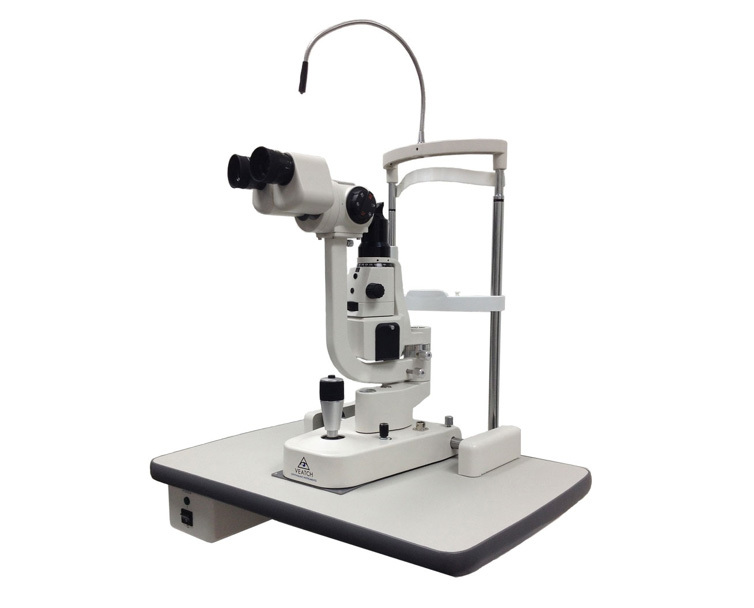 The E-200’s is a Haag-Streit style design with a vertical illumination column has been designed for practical use, with controls in common locations, a two-step magnification changer, and 16X and 25X magnification. 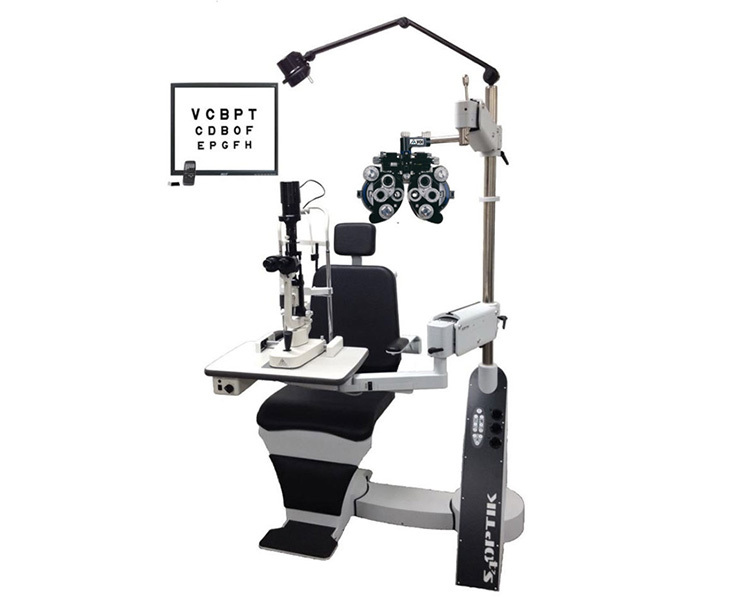 Veatch Z-500 is a Zeiss style design with a 5 Mag Slit Lamp: The lamp includes a Galilean-style optical head with magnification at 6X, 10X, 16X, 25X, and 40X. 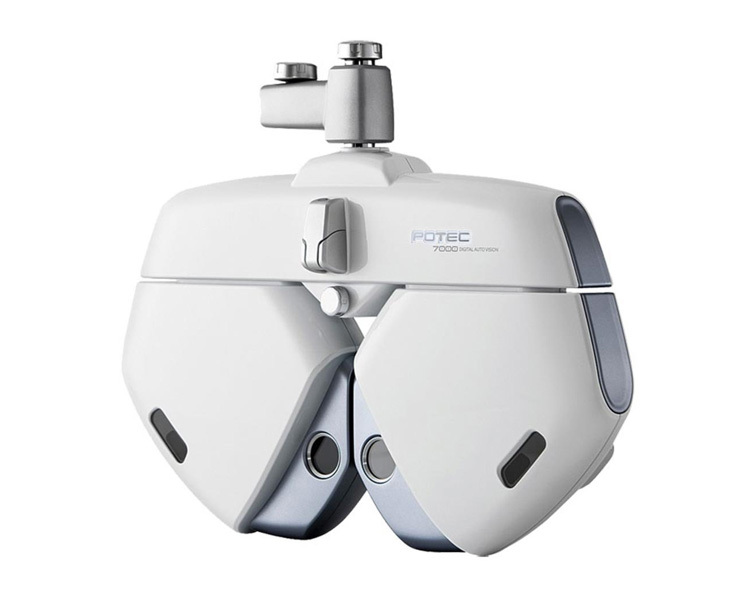 It’s ready for digital imaging, with a built-in trigger and compatibility with many anterior segment cameras. This chair and stand combo is optimized to meet both space and functionality needs of ophthalmologists. It includes a pneumatic assist reclining back, functionality for instrument delivery and instrument arms. Additionally, it has pivoting and tilt features, as well as an overhead halogen lamp. Our exam lane includes the Potec PDR-7000 Digital Refractor, which is a new, slimmed-down version of previous models. It has the same durability, but with added features and technology, like tactical buttons, a touch screen, programmable exam sequence and wireless interfacing with pre-testing equipment. 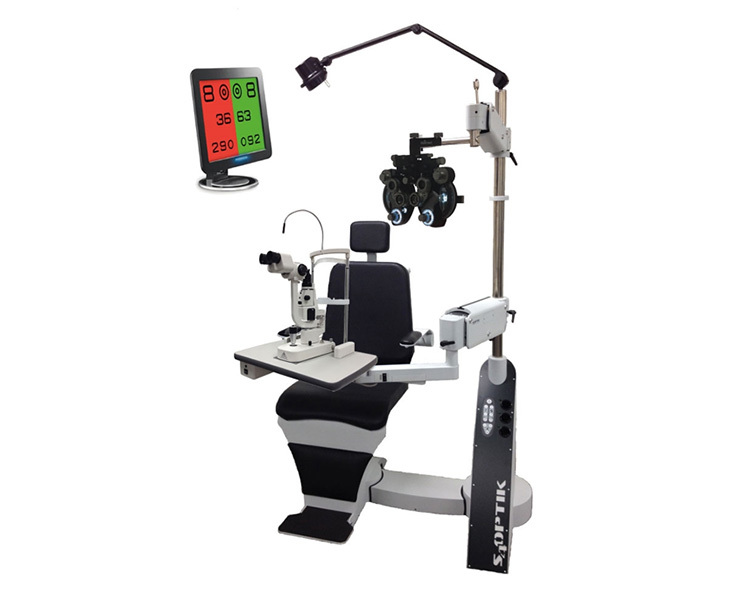 You have your choice of the Veatch Ophthalmic E-200 or Z-500 slit lamp. 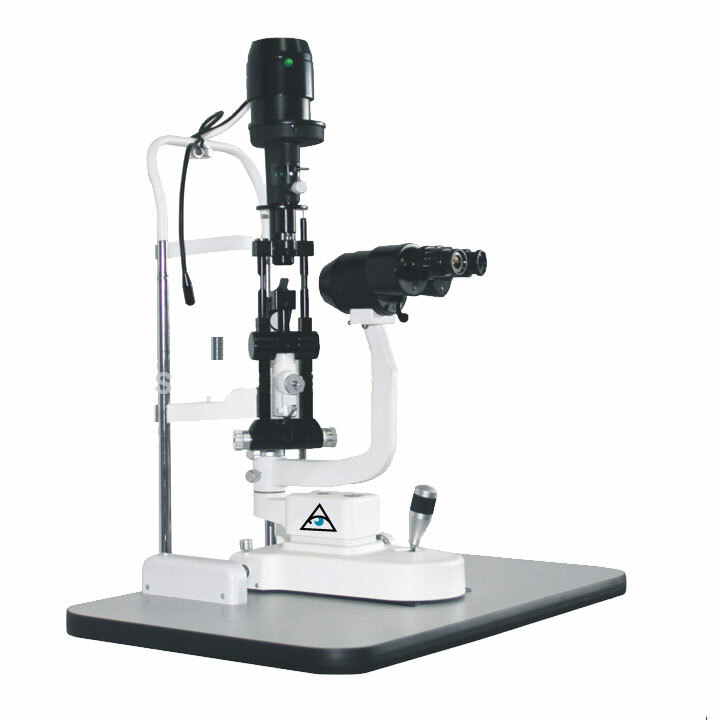 The E-200’s is a Haag-Streit style design with a vertical illumination column has been designed for practical use, with controls in common locations, a two-step magnification changer, and 16X and 25X magnification. 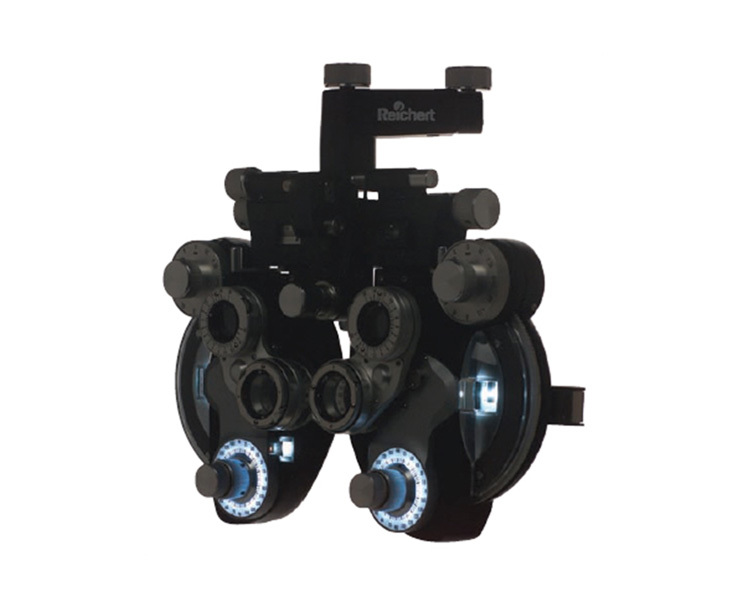 Veatch Z-500 is a Zeiss style design with a 5 Mag Slit Lamp: The lamp includes a Galilean-style optical head with magnification at 6X, 10X, 16X, 25X, and 40X. It’s ready for digital imaging, with a built-in trigger and compatibility with many anterior segment cameras. 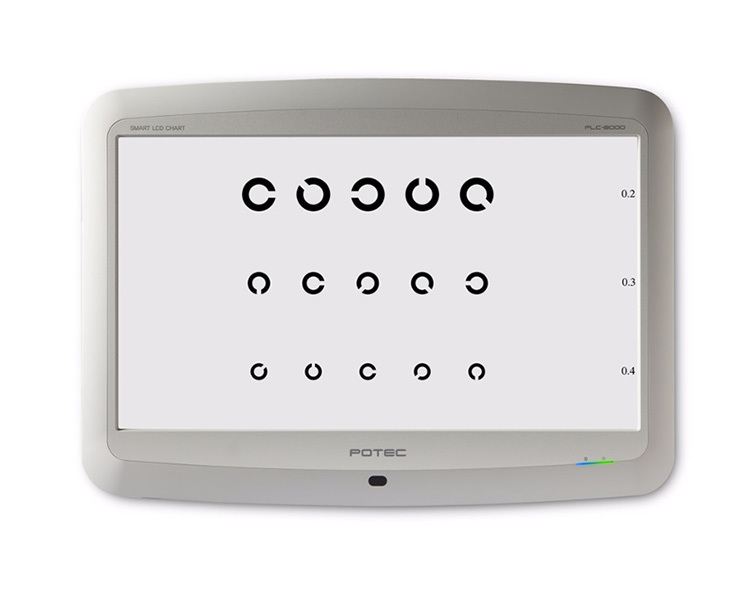 The Poltec PLC-7000 LCD Acuity Chart refracting device not only has a high-resolution 19-inch LCD monitor, but also includes a variety of popular charts, slide show options, and remote-controlled testing distances. The S40ptik 1800 combo chair/stand brings a space-efficient design with advanced engineering. 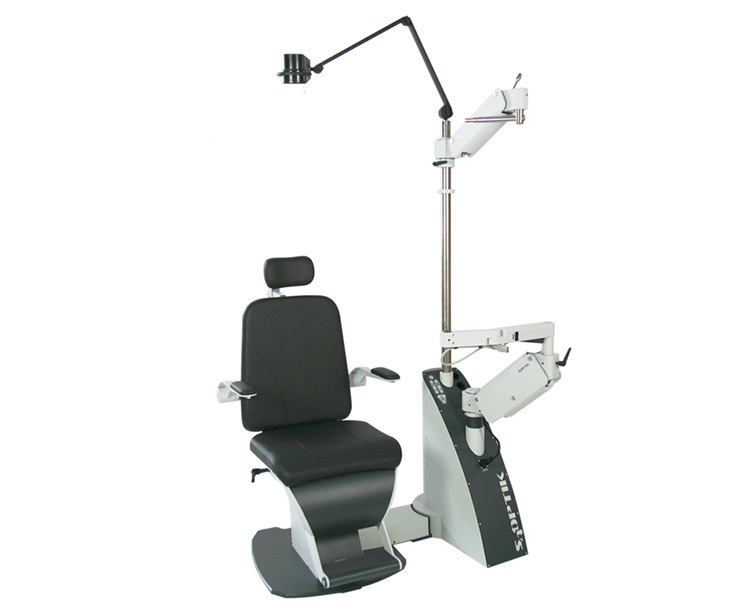 The manual reclining backrest, pivot tilt chair includes a counterbalanced refractor and slit lamp arms. Reichert’s Illuminated Phoroptor is designed to take care of you and your patient. The lighted sphere and cylinder axis scales and power allow you to read the dials without adding stress to your eyes. Energy-efficient LED lights are maintenance free, and the entire piece comes with a lifetime warranty. The lamp is a Zeiss style design that includes a Galilean-style optical head with magnification at 6X, 10X, 16X, 25X, and 40X. It’s ready for digital imaging, with a built-in trigger and compatibility with many anterior segment cameras. Setting up your practice: From layout to moving exam lanes, the Veatch technicians help maximize your efficiency, optimize the placement for electrical needs, and recalibrate pieces once the move is done. Ergonomics: In one study, 82 percent of optometrists found work-related physical discomfort, with pain reported in the neck, shoulders and lower back. Creating an efficient exam lane, first and foremost, is vital to providing professionals with a workstation that is conducive to good health for the professional as well as the patient. Rather than hunching over a slit lamp, stretching to reach an ophthalmoscope or visual acuity tool, or contorting your body to fit the demands of using a manual refractor, newer exam lanes include automated equipment that alleviates pain. 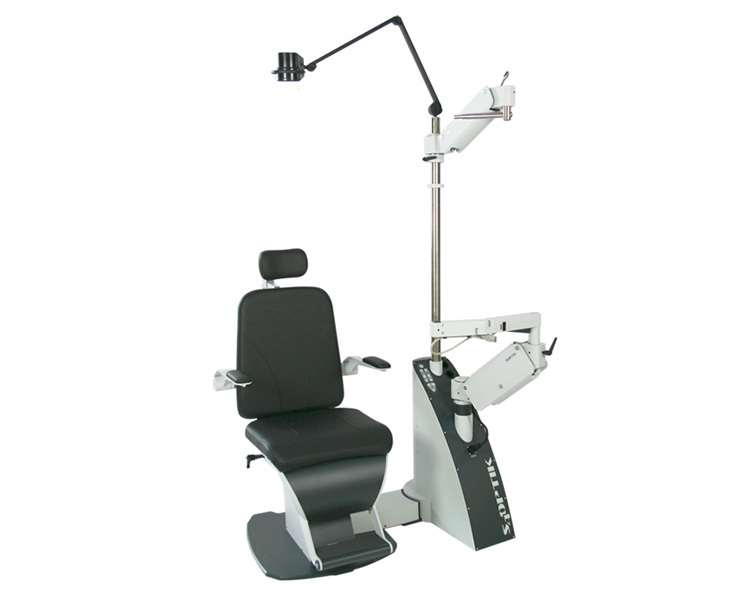 The exam chair and slit lamp are set to an optimal height that helps to reduce the risk of severe discomfort and later physical conditions. Compactness: An efficient exam lane has space for each necessary component. By purchasing a package, the exam lane has been designed to provide a space for each tool. Not only will this increase the ergonomic benefits, but will also save time during each appointment. Rather than searching for tools when they are needed, the exam lane allows professionals to find what they need, when the item is needed. Comprehensiveness: Efficient exam lanes contain all the necessary tools to complete an exam. In addition, these tools are all properly calibrated. Look for high-quality products that have a reputation for being durable. Increasing your number of patients also increases the amount of use and wear your equipment receives. 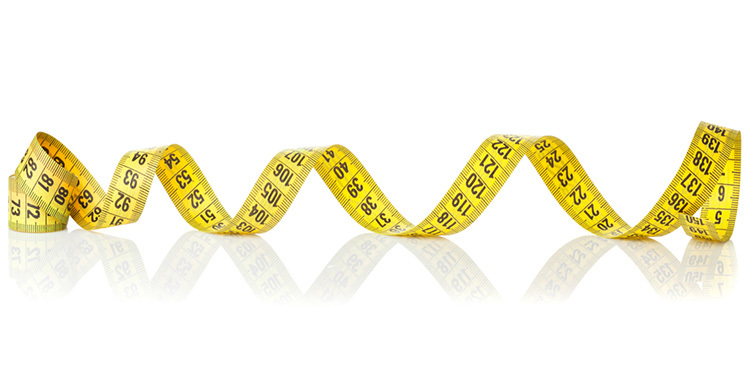 When evaluating exam lane packages, give us a call. We’ll work with you in a 15-minute evaluation of your practice to help you find the exam lane that best fits your office needs. In the past, it was much easier to find exam rooms that measured the true 20 feet. In today’s retail space market, however, rooms with those distances are hard to find, and with the technology available, leave you with wasted space. Ideally, the room should be between eight and ten feet wide, which leaves space for a standard-sized exam lane with a cushion, and between 12 and 14 feet long. Using the new options for technology allows you to give the same quality of care, service, and diagnosis without losing the space. This also allows for room for a desk or counter with a computer, several chairs for family members, and a technician. Some professionals found by creating smaller exam rooms, built around and with today’s technology, they have been able to create several testing rooms for retinal photography, corneal topography and more in-depth testing. If you were to buy each separate exam lane package piece separately, you could expect to spend more than tens of thousands of dollars, with some equipment retailing for more than $40,000. 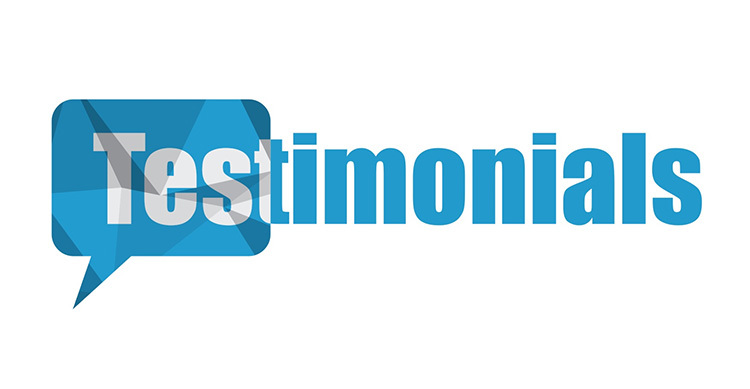 Our packages, however, have been designed to provide maximum value and quality at the best possible price. A quality exam package can be purchased for as little as $14,000, with more detailed, automated packages ranging from $20,000 to $40,000. Really! We could keep telling you what makes our service and products so uniquely impressive—but perhaps you should instead listen to our seriously happy customers. Whether you’re just opening your practice or want to upgrade and improve your technology, there is no better time to make an investment in your patients, your equipment and your business. At Veatch Instruments, our exam lane packages have been designed to bring you the best possible prices on high-quality equipment, helping you to operate more efficiently. Contact us today for a free consultation, and learn more about how an integrated exam lane can revolutionize your office.